First, for those who are unacquainted with the topic, gentrification is a term used to describe the rapid transformation of a neighborhood, from low-income (and typically racially diverse) to somewhat-affluent (and if we follow the cliche, white and hipster). The argument goes that when rich white kids start moving into a poor neighborhood, it is immediately flooded with development money and its long-time poorer residents are driven out by the rising costs of living. If this story is true, it certainly presents a problem for low-income residents of cities everywhere. However, if a recent study by Joe Cortright and Dillon Mahmoudi of City Observatory is to be believed, gentrification really isn’t the issue we should be talking so much about. Instead, concentrated poverty represents a much larger challenge for American cities. The number of high-poverty neighborhoods rose from 1,119 in 1970 to 3,165 in 2010. While only nine percent of high-poverty census tracts in 1970 saw their poverty rates decline to average or below average by 2010, 66% of high-poverty tracts stayed above the 30% poverty threshold. Additionally, 1231 census tracts with below average poverty rates in 1970 became high poverty by 2010. For every high-poverty neighborhood transformed to low-poverty by gentrification, 12 previously low-poverty neighborhoods have slipped into the high-poverty category. While the 105 neighborhoods experiencing dramatic declines in poverty rates saw a 33% increase in population over the 40 years, the 737 which maintained high-poverty lost 40% of their populations. Finally, most metro areas only had one or two neighborhood making the jump from high-poverty to low-poverty; much of American gentrification seemed to be isolated to Chicago, New York, and D.C. 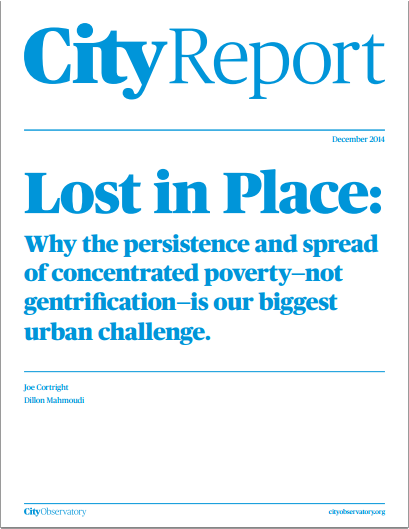 Overall, City Observatory concluded that “If we are concerned about the plight of the poor in the nation’s urban areas, we should be far more troubled by the multi-decade persistence of concentrated poverty and the continuing growth of high-poverty neighborhoods [than gentrification].” Most neighborhoods don’t seem to be gentrifying; rather, they are continuing their decay, losing population as the residents who stay remain in poverty. I’m not trying to argue that housing-shortage fueled gentrification isn’t an issue for some residents and cities, but perhaps it can be a distraction from the true causes of poverty that precede gentrification. Furthermore, Joe and Dillon highlight extensively the ills of neighborhoods with concentrated poverty, which they say now contain nearly 40% of the urban poor (up from 25% in 1970). “Concentrated poverty,” they say, “is a particular concern because all of the negative effects of poverty appear to be amplified in neighborhoods composed primarily of poor people.” Among these impacts are higher crime, health consequences, and economic constraints for future generations. 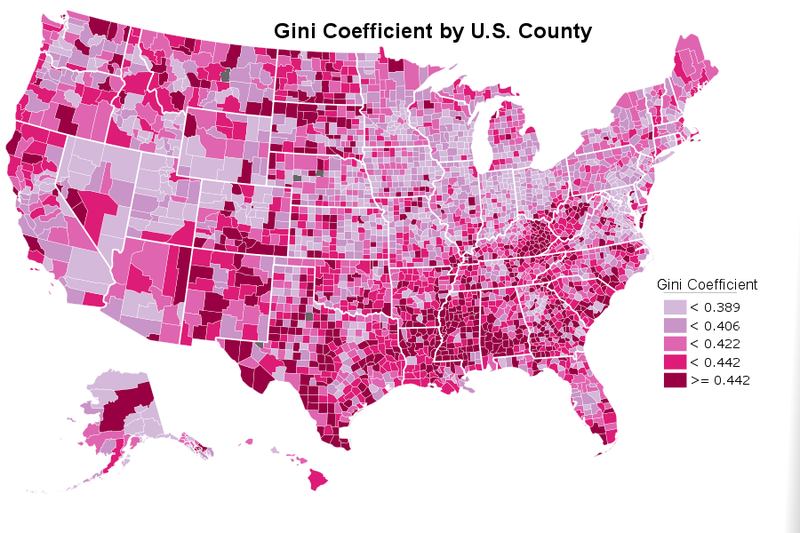 This map shows the average gini coefficient of each county’s census tracts. Counties in dark grey had insufficient population per tract for analysis. This brings me back to my research on diversity. I’ve been curious to see how census tract diversity impacts its economic conditions. So far, I’ve looked mainly at racial and educational diversity, but this study makes it clear that income diversity is important as well. A good measure of income concentration, and therefore, poverty concentration, is the gini coefficient. Above, you can see that I’ve mapped out average census tract gini coefficients for each county in the U.S., but I’ve run some correlations as well. Below are two plots which show how the gini coefficient relates to median incomes and unemployment rates for census tracts across the United States. 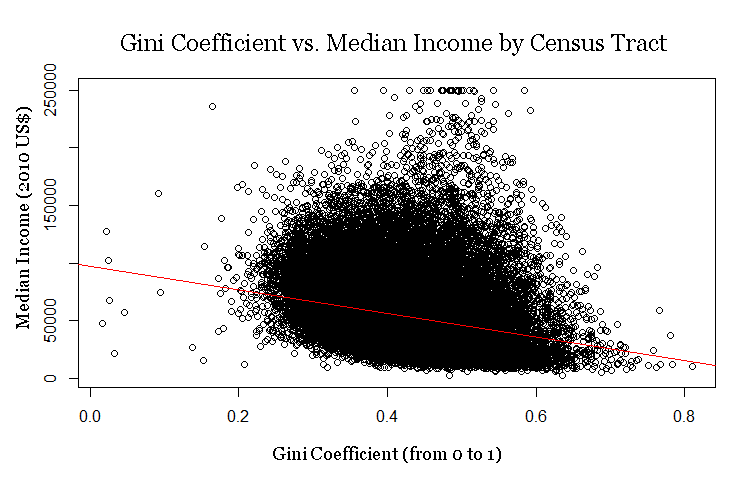 Here the gini coefficient for ~70,000 U.S. census tracts is plotted against their median incomes. Trend line in red. The correlation coefficient for these variables is -.244. All data is from the U.S. Census Bureau. 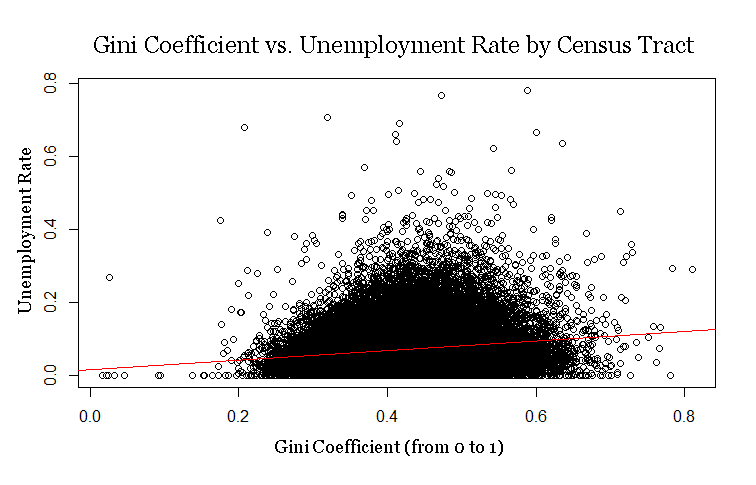 Here the gini coefficient for ~70,000 U.S. Census Tracts is plotted against their unemployment rates in 2010. The trend line is in red. Here the relationship is weaker, at only .17, but still significant. While I’ve seen many plots with more stark results, it is clear that there is some relationship between income equality and economic success, and that neighborhoods with higher income diversity tend to also have higher median incomes and lower unemployment rates. The bottom line is this: concentrated poverty, and by extension, income inequality, is a huge issue in our cities. Maybe we should spend a bit more time thinking about economic diversity for the poor among us than the gentrification that is not as prevalent as we might think. I will return to the issues of educational and racial diversity soon but for now, let me know what you think about the importance of income diversity in the fight on poverty. If you’d like to hear more from Joe Cortright about his study, please check out the Strong Towns Podcast, where I originally heard about City Observatory. Follow this link to listen.